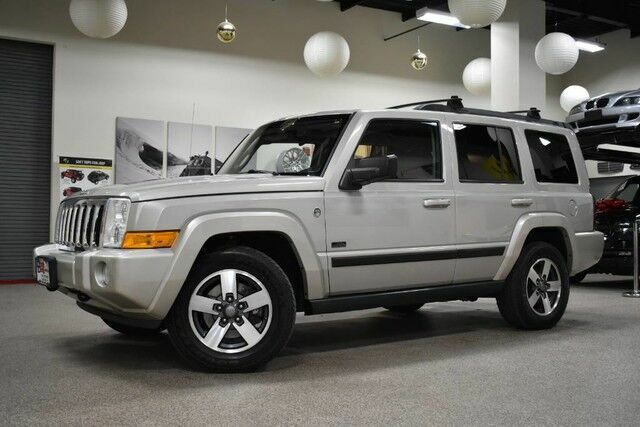 2008 Jeep Commander Sport Rocky Mountain Edition 1-Owner 4WD SUV with 81,000 all original miles. This is one of the nicest and cleanes ones you will find, original owner really took care of this vehicle and serviced it on time. It has clean Carfax history, non smoker and drives NEW. Please look at all the pictures to see how nice this vehicle is. This Jeep includes: TRAILER TOW GROUP Tow Hitch 5-SPEED AUTOMATIC TRANSMISSION (STD) 5-Speed A/T A/T PWR SUNROOF W/COMMANDVIEW Panoramic Roof Generic Sun/Moonroof 28W ROCKY MOUNTAIN CUSTOMER PREFERRED ORDER SELECTION PKG Fog Lamps Cargo Shade 3rd Row Seat Aluminum Wheels A/C CD Player Conventional Spare Tire AM/FM Stereo Generic Sun/Moonroof CD Changer Tow Hooks Sun/Moonroof Premium Sound System Rear A/C Pass-Through Rear Seat MP3 Player 4.7L V8 ENGINE 8 Cylinder Engine Gasoline Fuel SUN/SOUND GROUP CD Player AM/FM Stereo Generic Sun/Moonroof CD Changer Sun/Moonroof *Note - For third party subscriptions or services, please contact the dealer for more information. * This vehicle is loaded with great features, plus it comes with the CARFAX BuyBack Guarantee. The Jeep Commander is the benchmark all other SUVs strive to meet. With exceptional power, towing and handling, this SUV can handle anything thrown at it.